The odd and rare section of the game collection. As every console generation and iteration of the Biohazard games has seen either Alpha/Beta builds get out into the wild (or into the hands of us collectors,) or interesting promotional releases of the games from classic Trial Editions to media samples, all of those releases are placed in here for sake of coherence. For clarification this is exclusively for playable demos or builds, not promotional MV/PV discs where it is a video loop for a store display. Please see the Promotional Discs section in media for those. It is thanks to an incredibly good friend of mine, and fellow Biohazard aficionado, that I have access to this sample. 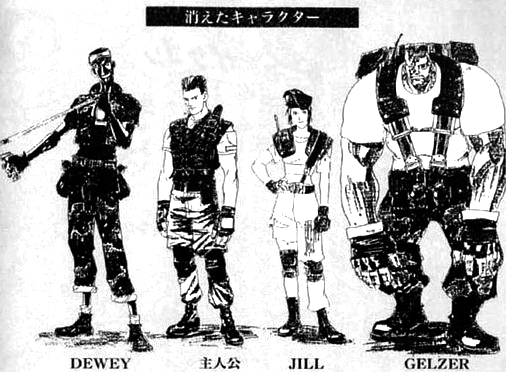 Back when Biohazard was in its infancy and many directions for the game as a whole were not finalised, Capcom issued these early sample builds to magazines for early access screenshots and impressions. 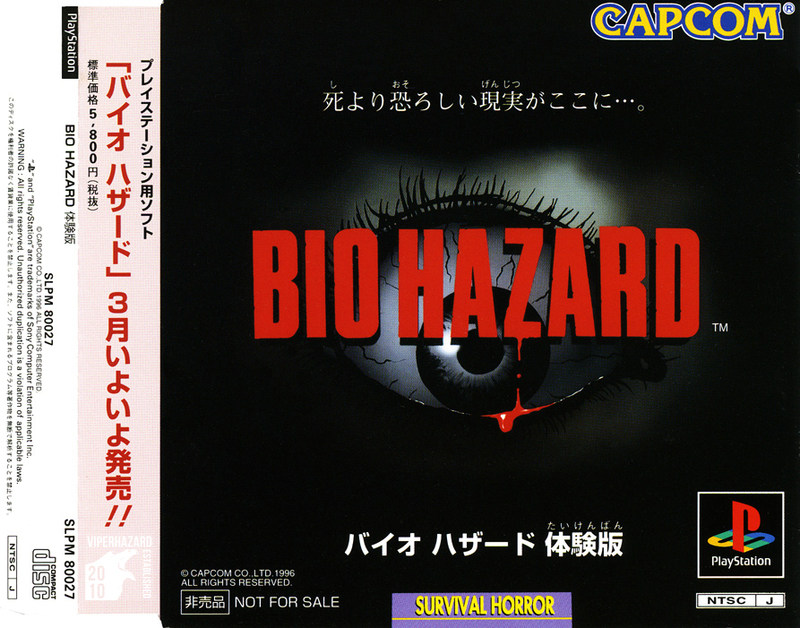 Though both known early builds of Biohazard that have made it out were specifically given to V Jump, Capcom later ended up having an exclusivity deal with Famitsu after the success of their first game. While I don't have the original disc the build was issued on, being given a copy of the original and unaltered ISO was a true honour between fellow collectors and archivists. This build in particular is very basic in its functions and many areas are inaccessible, in addition to that there is no menu system in place as of yet despite datamining confirming that menus (including one for battle — perhaps more like Sweet Home) were ready to be deployed. The gun can be reloaded infinitely, and many environment backgrounds and lighting are incredibly different to their final counterparts. It is well and truly the earliest alpha build, as digging into game assets makes it possible to find character portrait data for Dewey and Gelzer, two characters cut quite early on in development. Chris at this point was solely named as ‘protagonist’, while Jill already had her name. Both texture maps show a scorpion patch on their uniforms instead of the now-standard S.T.A.R.S. logo. This build is a lot more refined, and even introduces the menu screen officially. Both Chris and Jill are playable in this version, with both touting unique knife charge animations and other finite tweaks. Once again many backgrounds in this build are different, and this is probably one of the most well known builds for elements like the To Be Continued screen with Yawn out in the garden shed. A lot of items are in beta mode still as well, and feature early models that were later refined for the trial edition (see [PS03]) and final sample build January 31st of 1996. There are also differences in the files that are locatable in the build, with an entirely different Botany book located in the Tiger Statue of 1st floor west wing instead of upstairs in the 2nd floor east wing. An interesting build, and an interesting insight to how close to the line they changed a lot of things. 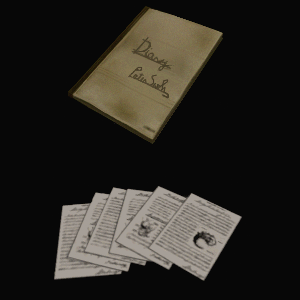 The best part is that the file images, intended to be in background of the files as they were read, also gave us a name for the poor soul who wrote the infamous Itchy Tasty diary: Peter Smith. This build. This entire build is the definition of holy grail. As above with the Biohazard 1 alpha builds, I don't have the original disc the build was issued on, but being given a copy of the original and unaltered ISO was a true honour between fellow collectors and archivists. This is not the Team IGAS/Magic Zombie Door build - that build was released after some rather awful incidents within the community, and ultimately because they'd meddled with the ISO to patch in "translations" (they were bad) they broke a lot of functionality of this build. This build is roughly 30-35% complete, and features a large number of unvoiced cutscenes for both Leon and Elza. With proper use of the in-game debug it is possible to get both Leon and Elza to the end game scenario in the laboratory subway. This build likely is what was used by Famitsu for a majority of their magazine caps during early 1997. Technically, from a retail standpoint, this is the most one of the more expensive trial discs sold as the only way to obtain it was through the purchase of Director's Cut. 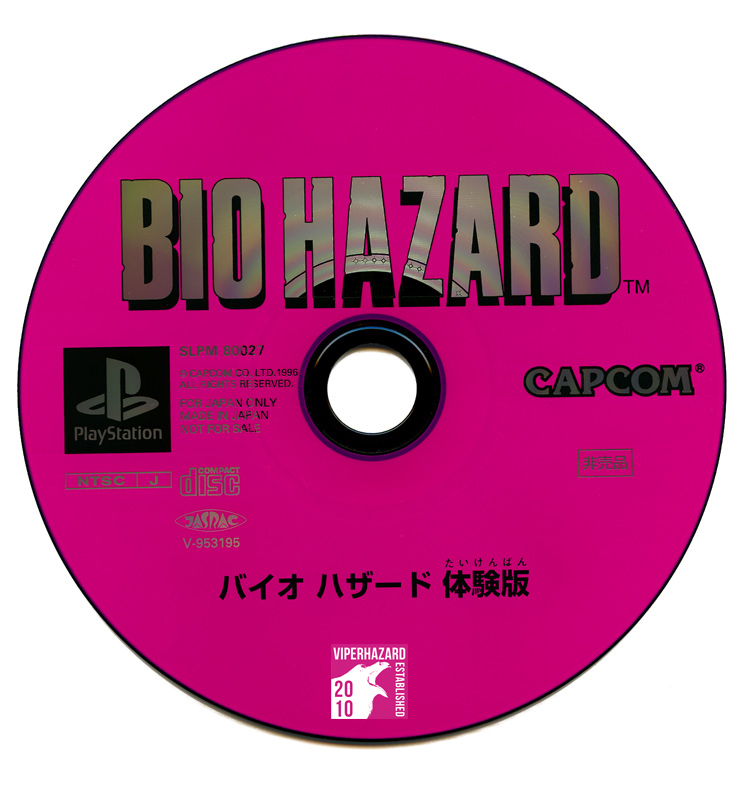 This retailer sample contains a solitary disc for the Leon side of Biohazard 2, packaged with an official slip from Capcom addressed to their distributors and retailers about the upcoming Dual Shock versions of Director's Cut and Biohazard 2. As far as I've been able to discern, both from the SLPS catalogue and playing the game (as PS1 disc matrixes are impossible to see due to the dark disc back,) the game disc itself is the same as the retail version that came out later on in August - kind of like the Dreamcast White Label discs we'd later see - but beyond that this is the only PS1 retailer sample ROM I've seen in the wild. Ever. As in when I came across it and confided in a close friend about if we knew what it was exactly I was met with excited yelling to buy it because it was the first one we'd seen! As described above, the included slip let us know a Biohazard Director's Cut Dual Shock Ver. of this retailer sample set exists as well. One day I might have the pair together. 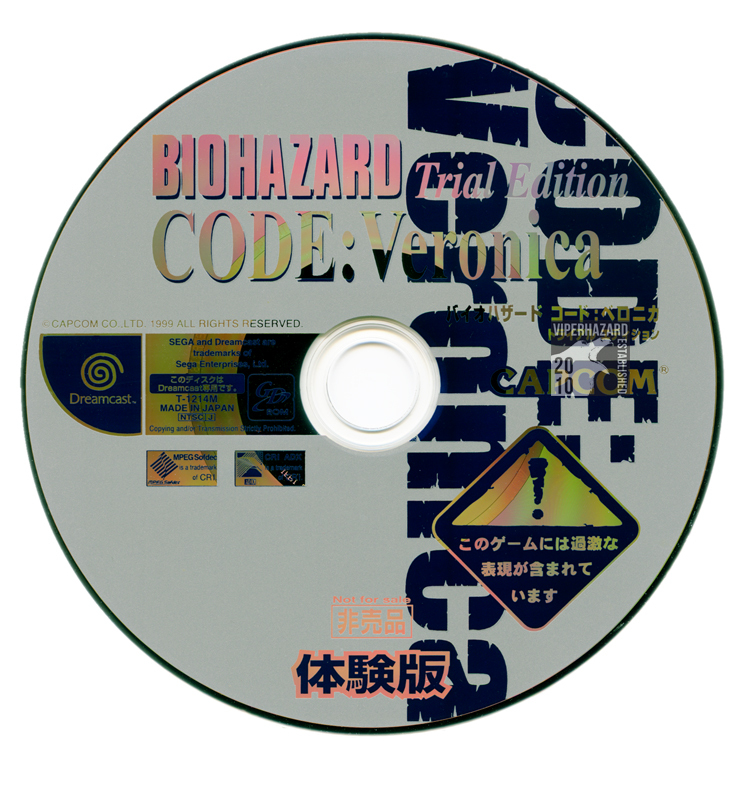 This Trial Edition of CV was only obtainable via purchasing the Value Plus release of Biohazard 2 for the Dreamcast. This trial edition is essentially quite close to the final retail build for CODE:Veronica with the first part of the Prison stage playable. There are a lot of interesting items however in the back-end which were not available in the retail version of CV once people managed to hack it, finding oddities like most files being actual items that you picked up (and then could be added to your files folder after reading/using from inventory), to ammo for the sniper rifle being obtainable, in addition to other beta files that were ultimately cut or re-done for the final build. Trial Edition also has a Sound Museum on the disc with a sample from Capcom's at-the-time current lineup of albums for the series. Acquired with the help of a very close friend. The first demo build to come out after the Director's Cut disc for Resident Evil 2, and it came out the same month the game released in the PAL regions. The demo is timed. This section is for consoles that have been specifically released for the Biohazard series (as in: limited edition consoles) along with the various hardware accessories released. Accessories can be anything from controllers, to memory cards, to specific additions like console cases, face plates, DS straps, et al. Somewhat to save my sanity from putting these all into the Official Items category which would bloat that section so badly, they're all here. If you'd like to find a specific item quickly, please utilise the code issued by the item's name in the index by searching for it with ctrl+f in your browser. The Dreamcast Veronica Model, as it is officially denoted on its box. Specially released for CODE: Veronica and the 5th Anniversary of the series as a whole, this limited Dreamcast was one of 1800 produced. The Claire version has a stunning transparent crimson top case to the console with a pink lid, and a french grey solid back. The rarer counterpart to this beauty was a deep blue/purple S.T.A.R.S. limited console which was released the same day but in much smaller numbers: 200 only. We know via extensive documentation from Dreamcast enthusiasts that the last 50 models of the Claire Version were sold via Sega's Dreamcast DIRECT service in 2001 - apparently with CODE: Veronica Complete instead of the vanilla release, while the last 30 S.T.A.R.S. versions were given to Famitsu for a giveaway contest. I worked hard to get this -- they're becoming increasingly harder to find at an affordable price, especially with the lower serial numbers, and I put some of my bonus from work toward this. Slowly but surely I'm getting all the 5th Anniversary items, and I love that most of them are CV based due to its release for the anniversary. What I love most about this particular item though is that with how SEGA handled Dreamcast production, the console has a history that is very clearly documented. In this case, the release date is noted on the base of the console box -- very handy for people doing archival work on releases -- and all stores were required to stamp or write their details on them. My model came from a shop called Chartland Narimasu, located at Itabashi-ku, Tokyo. It's still going to this day! Their address and number are even the same after doing some google diving. This was available for sale for a limited time and came with a copy of the limited edition version of CODE: Veronica [DC03], the pre-order metal 'Let Me Live' design plaque with Claire's prisoner ID on it [OI02], a Dream Passport 2 for online use, cables and documentation, and a matching controller [HA02] with VMU [HA03] which are documented below. This is a super pretty controller -- SEGA released a lot of nice alternate colouration controllers over the lifespan of the DC, but the ones that are exclusive to the Veronica Model pairs are quite striking. The back is solid french grey, with the top casing being in the Let Me Live crimson, and the VMU window is a striking Made In Heaven pink as homage to Claire's original outfit in BH2, which mirrors how the lid of the Claire Version also has that pink. The only way to obtain this was to purchase the entire Veronica Model Claire Version unit. They were never sold separately. The special Visual Memory Unit (or Visual Memory System as they were known in Japan) for the Veronica model of Dreamcast comes in the same unifying french grey that is used to balance the transparent colours on the console and controller. The unit also is specially adorned with the CODE:Veronica logo. The only way to obtain this was to purchase the entire Veronica Model Claire Version or S.T.A.R.S. unit. They were never sold separately. This is a really gorgeous DS Binder/Wallet which was made in limited quantities for the Biohazard DS Limited Pack. The binder itself is made of durable, 100% leather, and sports an embossed S.T.A.R.S. logo on the bottom right hand corner of the front. Sadly I lack an original DS to showcase it properly, so my 3DS makes a semi-decent substitute. Obviously, the case is made for the original DS, and only the original DS as all iterations later are just too small for it. A shame, since it would have been cool to pick up a second one of these cases to use practically. If you'd like to see the pack this originates from, please see item [HH01] on the handheld games page. Like the DS Binder, this strap only came as part of the Biohazard DS Limited pack. Since the strap is designed for the original DS, it's got some decent length to it, and is pretty sturdy. My 3DS is again a brilliant example of how big it is, as is a 3DS game case. It's certainly long. The design is simple and designed to go nicely with the leather binder, just sporting the text S.T.A.R.S. and what it means outside of the acronym. A gorgeous all-red console that only saw release worldwide as an Elite pack -- this was the only way to get this colour, and so it's always remained tied to the series thanks to that. Being an elite pack the console came with a 120GB HD, a matching red controller, a headset, charging cable, and all required hook up cables. The console also came with a hard copy of Resident Evil 5. Though not the only controller for the 360 made in red, the limited edition Resident Evil 5 console was the only X-Box in production with this specific warm-red tone. My one is a little worn, mostly in the thumbstick on the left side, from heavy use before I was unable to actively play my 360 anymore due to injuries making the controller style very uncomfortable with its asymmetrical layout.